Background: Internationally there is an increasing amount of peer-reviewed literature pertaining to disaster nursing. The literature includes personal anecdotes, reflections, and accounts of single case studies. Furthermore, issues such as the willingness of nurses to assist in disasters, the role of nurses in disasters, leadership, competencies, and educational preparedness for nurses have been the focus of the literature. 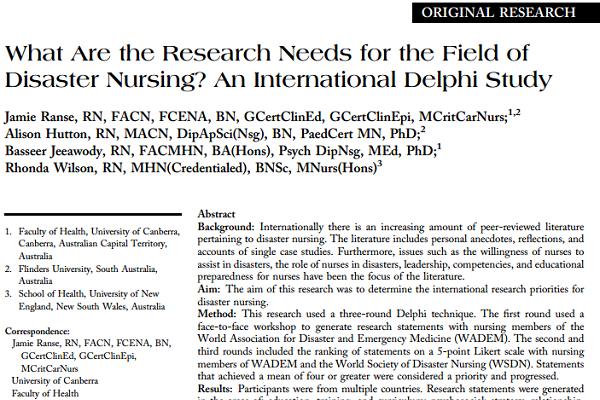 Aim: The aim of this research was to determine the international research priorities for disaster nursing. Method: This research used a three-round Delphi technique. The first round used a face-to-face workshop to generate research statements with nursing members of the World Association for Disaster and Emergency Medicine (WADEM). The second and third rounds included the ranking of statements on a 5-point Likert scale with nursing members of WADEM and the World Society of Disaster Nursing (WSDN). Statements that achieved a mean of four or greater were considered a priority and progressed. Results: Participants were from multiple countries. Research statements were generated in the areas of: education, training, and curriculum; psychosocial; strategy, relationship, and networking; and clinical practice. Psychosocial aspects of disaster nursing ranked the highest, with five statements appearing in the top ten research areas, followed by statements relating to: education, training, and curriculum; clinical practice; and finally, strategy, relationship, and networking. Conclusions: Future disaster nursing research should focus on the area of psychosocial aspects of disaster nursing, in particular, both the psychosocial needs of a disaster-affected community and the psychosocial well-being of nurses who assist in disaster health activities. Well, it was an interesting and informative post and I would say that as research statements were generated in the areas of: education, training, and curriculum; psychosocial; strategy, relationship, and networking; and clinical practice the same practice should be followed for the other areas with strict guidelines.